I am sitting on the floor of our apartment writing to you to let you know two things: 1) We are alive! (despite the fact that I’m waist-deep in moving boxes) and 2) These Caramel Coconut Chocolate Chip Bars? They’re INCREDIBLE. And they’re gluten free, too! So maybe that’s more than two things, but the point is this: When you decide to move your entire house into a two-bedroom apartment for a short time, or you need an easy and simple and delicious dessert to feed everyone who is helping you move (MANY BLESSINGS TO YOU, Mom and Dad), or you just have an insane hankering for chocolate chip cookies with a little extra something, these bars are for you. To bring you up to speed, we are currently moved out of our old house and into an apartment for the next few months while we wait for our new house to be finished building. So this weekend, we schlepped everything we own out of a 1,700-square-foot house into a 1,000-square-foot apartment (which, trust me, that extra 700 square feet makes a big, big difference) and we will be living here until the new house is complete in December (fingers crossed!). It was a bittersweet moment to leave our house, but we are able to take the good memories we made within it with us, and I’m holding onto that as we patiently wait for our new home to come together. Until then, it’s us, a million moving boxes and many plans to make these dessert bars on the regular. 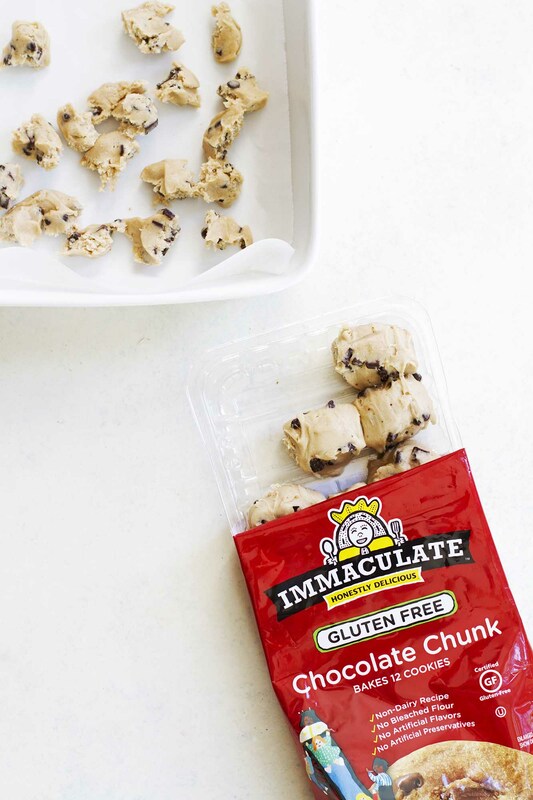 The base of these bars is a breeze thanks to Immaculate Baking’s gluten free chocolate chunk cookie dough. I simply crumbled up the cookie dough, pressed it into the bottom of the pan, par-baked it until just set (SO hard not to dig into that gooey deliciousness right then and there) and then topped it with a simple caramel sauce, chocolate chips, toasted pecans and flaked coconut. In no time, these bars were ready to consume. 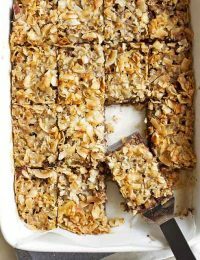 What I love about desserts like these is that not only are they easy to make, but they’re easy to travel with for dinner parties and potlucks and the like, and because these are gluten free they can be eaten by nearly everyone. They can please the chocolate chip cookie lovers, the caramel lovers, the coconut lovers and the any-dessert-you-put-in-front-of-me lovers (you can guess which one I am). And if you want to put your own spin on them, too, feel free! 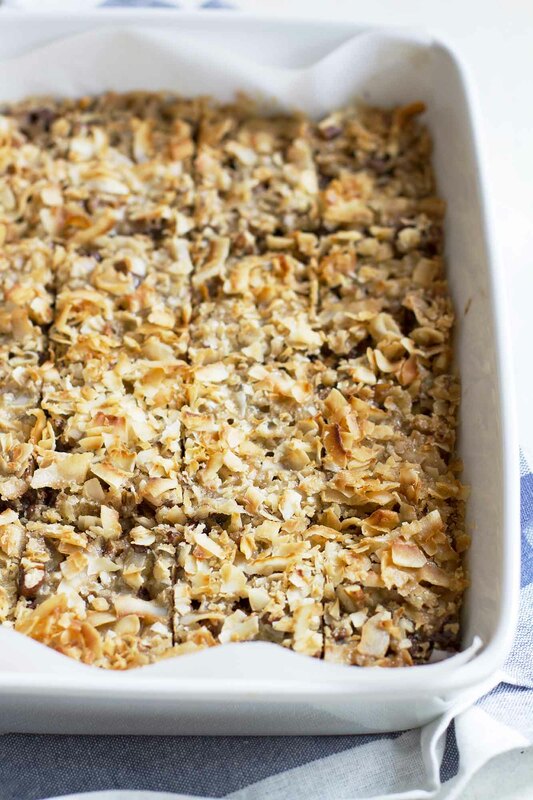 You can bake them in a square pan for thicker bars (just be sure to adjust the baking time as they’ll take longer to fully bake at that size), swap the unsweetened coconut flakes for sweetened coconut flakes for even chewier bars, or swap out the pecans for chopped almonds or walnuts. There are endless choices here. But don’t let it overwhelm you! Just take a bite of a caramel coconut chocolate chip bar and relax. That’s what I plan to do… while I also daydream about all these boxes unpacking themselves. Heat oven to 325 degrees F. Spray bottom and sides of 13-by-9-inch baking pan with cooking spray. Line with parchment paper. Break up cookie dough rounds and press evenly in bottom of pan. Bake 18 to 20 minutes until crust is golden and puffy. Meanwhile, in medium saucepan over medium-high heat, combine butter, sugars, heavy cream and sea salt; bring to a boil. Cook, stirring constantly, 2 to 3 minutes until mixture is thick enough to coat back of spoon. Remove from heat; stir in vanilla. 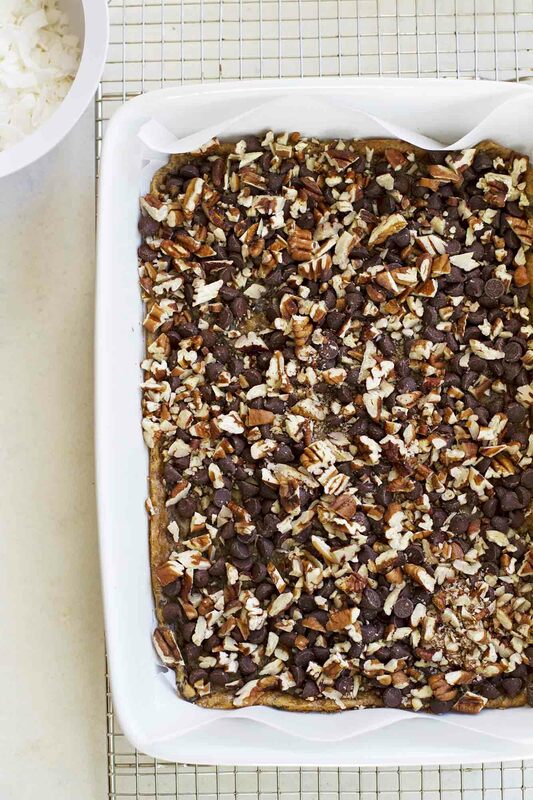 Sprinkle chocolate chips and pecans evenly over crust. Drizzle caramel mixture over top. 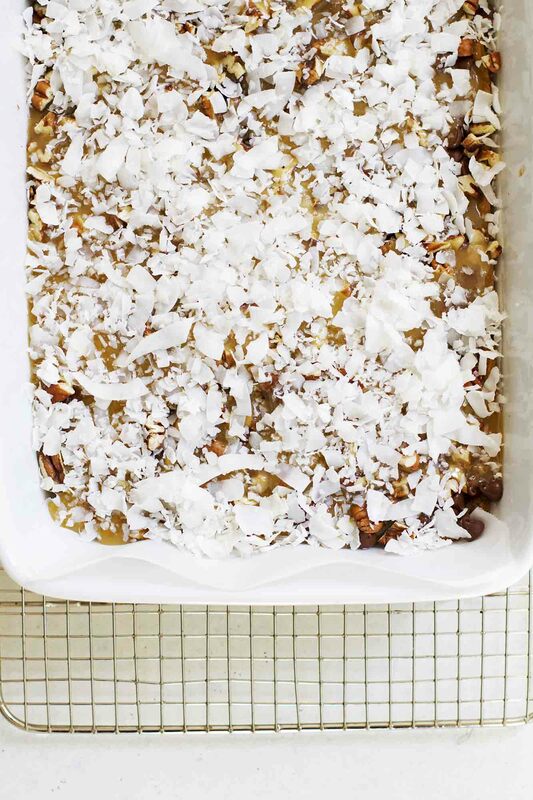 Sprinkle evenly with coconut. Bake 20 to 25 minutes until caramel bubbles and coconut is toasted. Cool completely on cooling rack before cutting into bars. Cannot wait to see your new place! I’m sure these next few months will fly by and you’ll be moved in before you know it 🙂 Plus, having a pan of these on hand (and wine…!) will help! That does sound stressful! Especially since you know you’ll only be there a few months…but of course, a blogger’s busiest few months 🙂 the new house will be so worth it though! And these bars DEFINITELY make it all okay. They look so delicious! 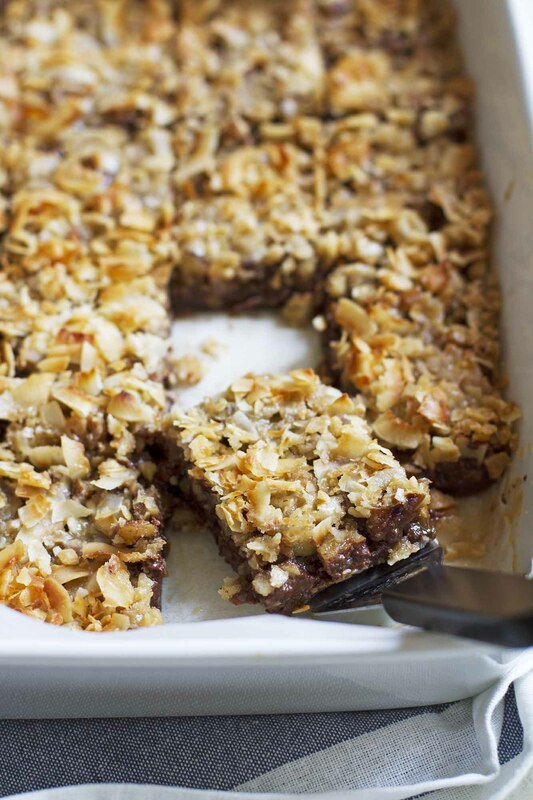 Can’t go wrong with chocolate, caramel and coconut. I so need one of these beauties with my afternoon coffee! What a genius way to doctor up some pre made cookie dough! I cannot even imagine going back to our old place after spending out in every single closet in our house. It’s only a matter of time!!! Hang in there girl! Taylor — YES, to these bars + wine. 😉 Thanks, girl! Rachel — Oh, right? The most wonderful time of the year. 😉 Good things these bars can help me out in times of stress, lol! Lauren — Agreed! Next time please! Stefanie — Oh my goodness, it’s amazing how quickly the stuff accumulates, lol! Best of luck Stephanie! Having just moved across the country I know what you are going through but how exciting to have a brand new home!! 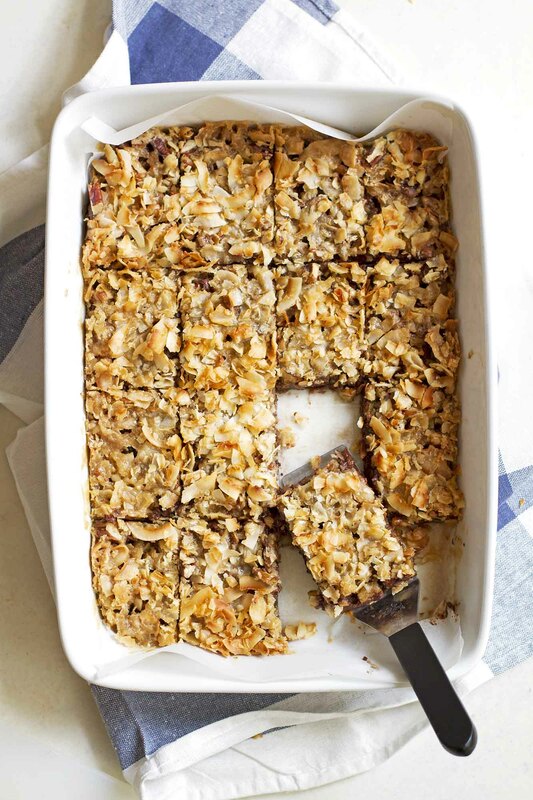 These bars look super yummy so there’s always that, right?! I would love one of these bars with my cup of coffee right now! They look great!